Strawberries are relatively simple little plants. Their genomes have been completely mapped, and their life cycles are fully understood. But, as simple as strawberry plants may seem, they are still complex enough to warrant study; and, the study that goes into them continues to reveal much fascinating information. This post is dedicated to that topic of plant fertilization that sometimes can induce somnambulism in all but the most ardent botanists: strawberry pollination. 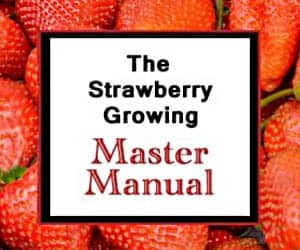 But, once you’ve reviewed this information, you’ll be ready to tackle hand pollination of strawberries or be better able to situate your strawberry bed in the most ideal location for growing gargantuan berries! There is quite a bit of confusion surrounding what strawberries can and can’t do when it comes to strawberry pollination. A bit of background information should help clear some of the muddled minds out there. First of all, let’s note what the recent research shows: strawberry pollination is good for plants. Sure, I know that is the way the plants roll, but in our hi-tech society, more and more means of manipulating living organisms in order to boost yields and support the calls for bigger barns are churned out annually. Lost among the latest man-made development is often the simple fact that nature often does it best. When it comes to strawberries, the largest, plumpest, most colorful strawberries are actually the ones that were trod upon heavily by 6-legged chitin-covered creatures when they existed in their flower stage. The more heavily pollinated a strawberry is, the bigger and better the berry becomes. Secondly, strawberry plants produce flowers that are hermaphroditic. That means each strawberry flower contains both the male stamen and the female pistil. Pollen from the stamens at the outer edge of the flowers must make it the short distance to the pistils in the center for any fruit to set. If a strawberry plant is grown completely undisturbed in a hermetically sealed apparatus with no wind or other movement, pollen wouldn’t make it to the pistils, and there would be no strawberries. Thirdly, however, is the fact that strawberry plants are frequently (and accurately) described as “self-fertile.” What that means is that if your strawberry plant has only one flower, pollen from the poor fellow will suffice to fertilize itself and form a berry, providing the pollen reaches the pistil. Remember, strawberry pollination is good. The more you have, the better your strawberry haul. Pollination makes larger and more numerous berries in virtually any strawberry bed. So, here is how to pollinate strawberries using three different methods. 1. Let the insects do the work for you. This is actually the best method of strawberry pollination. 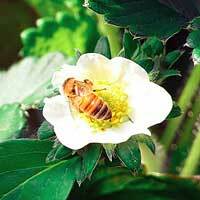 Insects, especially bees, will find and pollinate strawberry flowers quite effectively. Planting your strawberry patch where it will receive the most attention from the creepy-crawly-flying thingies is a great idea. Remember, the more pollination that occurs, the bigger your strawberries and your overall yield. What is fascinating is that insect diversity actually matters. Domesticated honey bees will focus their fertilization on the top of the flower while wild species of bees typically fertilize more heavily around the base of the flower. Each fly or butterfly or beetle that comes sniffing around will also fertilize the strawberry (albeit less effectively) by spreading pollen around. In short, insect diversity matters. You want the biggest and best strawberries? Let the bugs flock forth to do their strawberry pollination. 2. Let the wind do it. Even gentle breezes are sufficient to transfer the pollen a few millimeters from stamen to pistil. So, even in the absence of bugs (like an a hydroponic set up or a bug-free window sill), strawberry pollination can still occur. However, wind or breezes often won’t do a great job. So, you will probably end up with fertilized strawberries (at least a few), but you might be disappointed with the overall haul. 1. Heavy pollination increases the overall yield of strawberry plants. 2. Cross pollination leads to decreased deformations and an overall higher-quality aesthetic. 3. Cross pollination results in larger overall strawberries than self-pollination or same-variety pollination. Remember, insect diversity also matters. Get as many good bugs to visit your plants as possible! 4. Natural strawberry pollination increases commercial viability also. Bee pollination results in brighter and redder berries, which are more pleasing to customers. Natural pollination also improves quality by reducing spoilage. To quantify, studies show that bee pollination results in 39% greater value than wind pollination and a whopping 54% greater value than self-pollination. How Does Pollinating Strawberries Make Them Better? While it is observable and repeatable that strawberry pollination improves strawberry harvests (as well as affecting other fruits by increasing firmness (in melons and cucumbers) and sugar content (in a few other fruits)), the science behind it isn’t fully understood as of yet. The most likely explanation for the dramatic beneficial effect that pollination of strawberries has is that it stimulates two major plant hormones, auxin and gibberellic acid. Gibberellic acid provides increased shelf-life by delaying softening of the accessory flesh of the strawberries (the red part). This assists berry longevity by reducing the bruising that strawberries so frequently suffer and diminishing susceptibility to mold. Auxin, on the other hand, increases cell division and growth. The result of auxin stimulation is increased weight and firmness of the fruit. As to the reasons why pollination of strawberries affects their color, your guess is as good as anyone else’s for the time being. The processes that are involved in the upregulation of the bioflavonoids that give strawberries their signature hue are unknown at present. It does make a sort of sense, however, that the prettiest fruits attract more animals that better disperse the seeds after consumption. I’d have to admit that I’d go for the biggest, brightest strawberries first myself! Hooray for strawberry pollination! Hello. i started my strawberry plant in a container and then transfered it into on of my hanging bags outside on my patio. now my leaves are turning brown. what does this mean? Can I mix June bearing, day neutrals, and everbearing in the same patch? Will cross pollination adversely affect any of the varieties or will they stay true? Good day Mr strawberry. I am from South Africa. Can I have some advice please? I am thinking of doing strawberries in hydroponics in an enclosed building. temperatures in the building is not very high. There will be growing lights in the building. I am thinking of using “fortlaramie”, “tristar” Ozarkbeauty” and Quinault” variety. Can I cross pollinate the varieties with each other and can this be grown in a hydroponic system? For hydroponic systems, the day-neutral varieties are indeed the best. Tristar and Tribute are two of the most popular. However, cross pollinating them will not give true-to-variety cultivars and should probably be avoided. Good luck! I have indoor strawberry that I pollinate with a paint brush. I try to pollinate each flowers once a day to increase my chances to get strawberry. In your article you say the more the better when it comes to pollination. How often would you say is good? The more varieties of pollen you can cross pollinate with, the better. After a day or two of hand-pollinating, they should be sufficiently pollinated. Good luck! I was wondering if you could help me. I have a strawberry greenhouse and I am Faced with problems during pollination period. More then of 70% of flowers have no petals( or much smaller petals than the carpel). How could I send you some pictures of the flowers? Could I ask you give me some information for solving the problem? Do you live in a temperate region? If so, do insects have access to the plants? If the flowers are properly fertilized and you have a good harvest, I wouldn’t worry about the appearance of the petals. If you don’t, I’d recommend having your soil tested for deficiencies. Good luck! How can I pollinate strawberry flowers by hand PROPERLY? I tried the method to hand pollinate them but it didn’t work. Do I need to pollinate the flowers by transferring pollen into other flowers or what? You can get a very fine artist’s paintbrush (very fine bristles) and gently “paint” all the flowers. The pollen from one will stick to the bristles and be transferred to the others as you brush them, similarly to how bees do it. Good luck! If I need to use row covers to prevent pests from eating my berries, how often and for how long do I need to remove them to allow enough insect activity? If you have June-bearing strawberries, I’d recommend keeping them uncovered until the first berries start to ripen and then covering them. The pollination on the later berries won’t be as good, but you will probably maximize your harvest that way if you have a traditionally bad pest problem. You might also want to try leaving them uncovered and liberally applying diatomaceous earth. Some success might be had that way as well. Good luck! Planted about 10 plants last year that grew like crazy and produced quarts of strawberries all summer long. They also sent out runners all over, so now there are many more plants. They made it through the winter and produced early this spring but not big, beautiful strawberries like last year. Since that early amount,they have done little to nothing. Last yr we had a plum tree next to the berries that brought bees all season long. We took it out because it was a terrible plum that nobody liked. Could our problems be related to the almost total lack of bees around the berry patch? Yes, it is possible since good pollination does help increase berry size. More probably, however, your plants are overcrowded. I’d try thinning them to no more than 3 per square foot and see if that makes a big difference for next spring. Good luck!